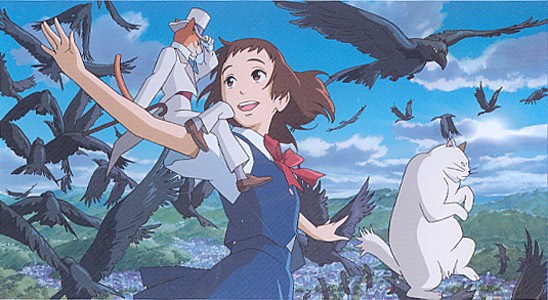 The Cat Returns is something of a loose spin-off of "Whisper of the Heart" as it features two characters from that film: Muta (the cat from "Whisper") and the Baron (the cat statue from "Whisper"). There is no other connection between the two movies and this is not a sequel. The story is based on Neko no Danshaku (Baron of Cat) by Hiiragi Aoi. The main character of the story, Haru, is a clueless, ordinary 17-year-old girl. She has no special abilities and neither is she an extraordinary beauty. When faced with reality, she is unable to make decisions for herself, thus often sways to others' opinions to avoid challenge. One day, Haru saves the life of a cat without considering her own safety. The cat turns out to be the Cat Prince from the Kingdom of Cats, however as a result, Haru is trapped in the world of cats. Can Baron and Muta rescue Haru who has wandered into the world of cats?